Four days after playing out a goalless draw with world champions Germany at Wembley, England repeated the feat against the mighty Brazil. 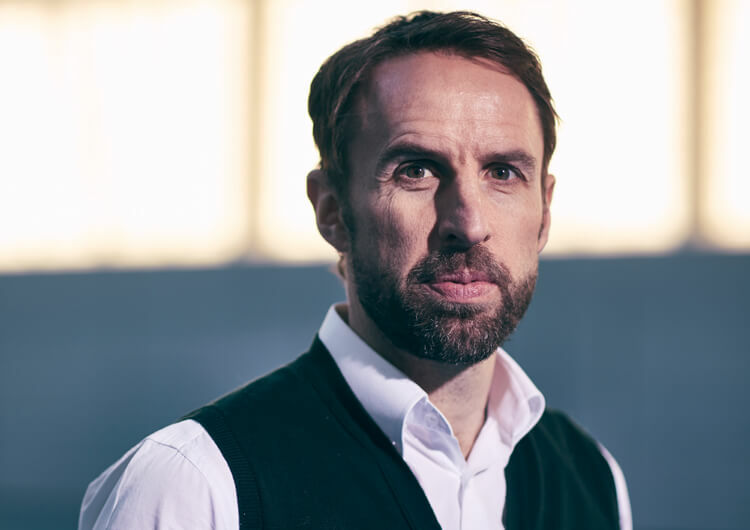 Gareth Southgate’s young side rarely looked like troubling a team that qualified for Russia with serene ease in the wake of their disastrous home World Cup campaign. But a three-man defence comprised of Joe Gomez, John Stones and Harry Maguire coped manfully with all a front three of Gabriel Jesus, Philippe Coutinho and Neymar could throw at them. 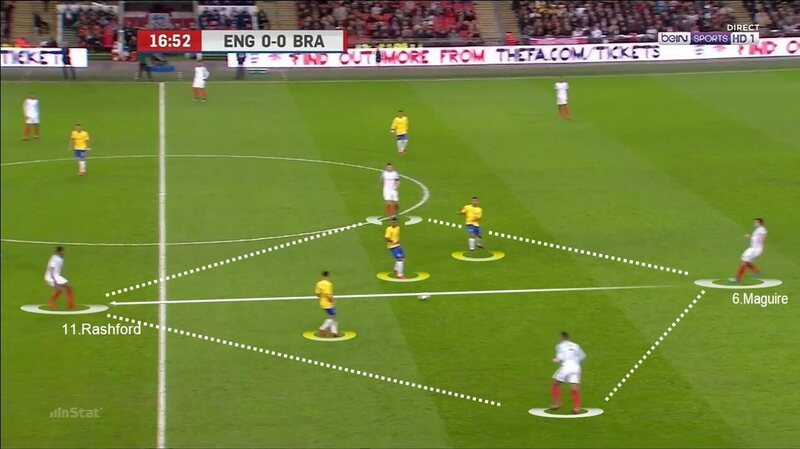 Gareth Southgate’s side started in a 5-3-2 formation, pushing the wing-backs forward to make a 3-5-2 in attack. The front two of Jamie Vardy and Marcus Rashford tried to disrupt the Brazilian passing game and direct them towards wide areas, showing a disciplined attitude as they dropped back to defend. The hosts were also defensively strong in midfield, where the trio of Eric Dier, Jake Livermore and Jesse Lingard – a first-half replacement for Ruben Loftus-Cheek – worked hard to shut down space and intercept as much as possible. Southgate’s approach successfully minimised the threat of Brazil’s chief threats, Neymar and Philippe Coutinho, throughout the match, forcing them to drop deeper and deeper in a bid to influence proceedings. The three England centre-backs occupied key positions in front of their own goal, as well as outmuscling the three opposition strikers with the help of their full-backs. Joe Gomez in particular impressed on the right side of the back three, supporting Kyle Walker effectively and getting the better of one-on-ones with Neymar. In defensive transition, England were able to quickly hold up the man in possession and slow down any Brazil counter-attacks while the rest of the team retreated into their defensive shape. The aim was always to recover numerical superiority in their own half, and look to commit tactical fouls if this looked difficult. 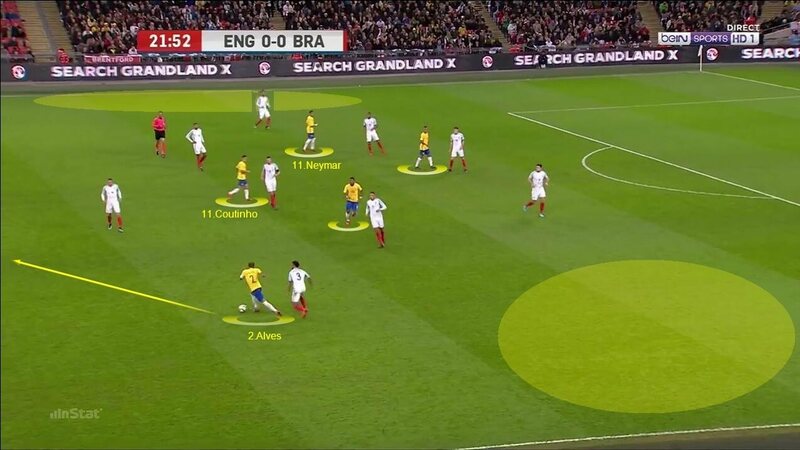 In attack, England looked to play direct into their most advanced players and have supporting runners ready to drive towards the Brazil defensive third. They looked in particular to outnumber Marcelo on the Brazilian left, with both Vardy and Rashford looking to play off Kyle Walker throughout – but the left-back, well supported by the left centre-back Miranda, was never really exposed. When the hosts did enjoy possession, they looked mostly for Dier or Lingard, both of whom managed to find space in between the lines and give the Brazilian defenders some problems. This became more prevalent in the second half, as England made better use of the spaces and were able to pass the ball around more. Rashford in particular found gaps in which to trouble Brazil with his pace, while the wing-backs also pushed on, but the visitors were well organised in defensive areas and never looked massively threatened. 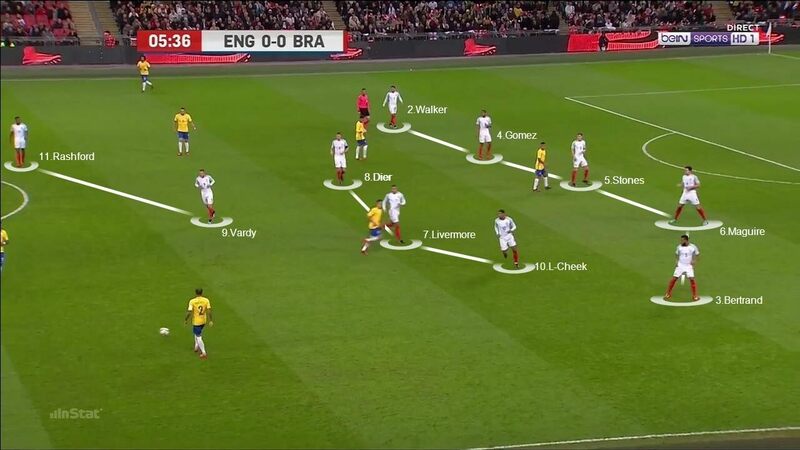 England deployed direct tactics on the counter-attack, trying to connect with Rashford and Lingard in intermediate areas so that they could make the most of the space in behind the rival midfield line.  Without ever really managing to get numbers forward to support, however, any attacks were largely reliant on individual runs. 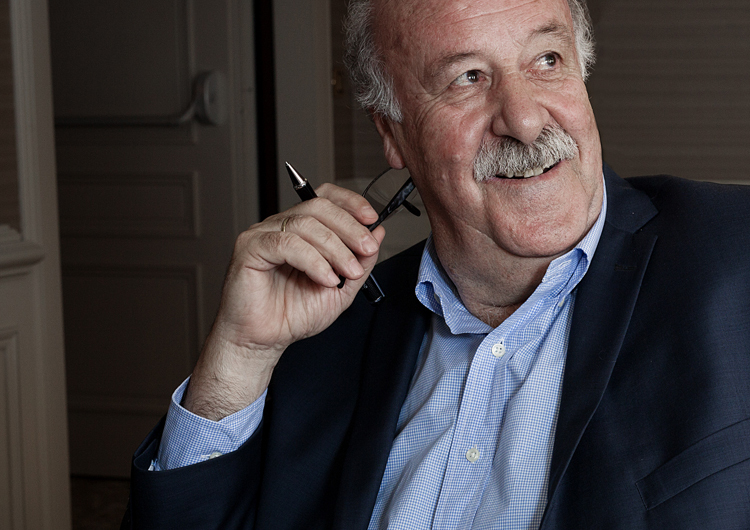 England adopted a 5-3-2 defensive system out of possession, in a medium block. 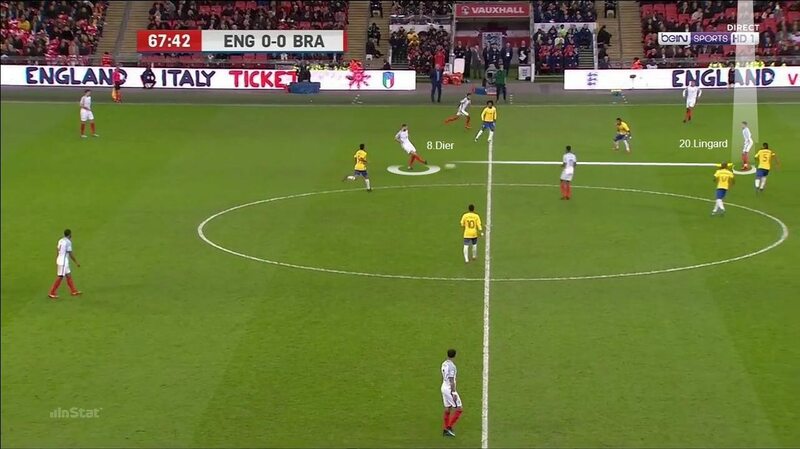 This shows the positioning of the two strikers – Jamie Vardy and Marcus Rashford – in their own half, directing Brazil towards the flanks. 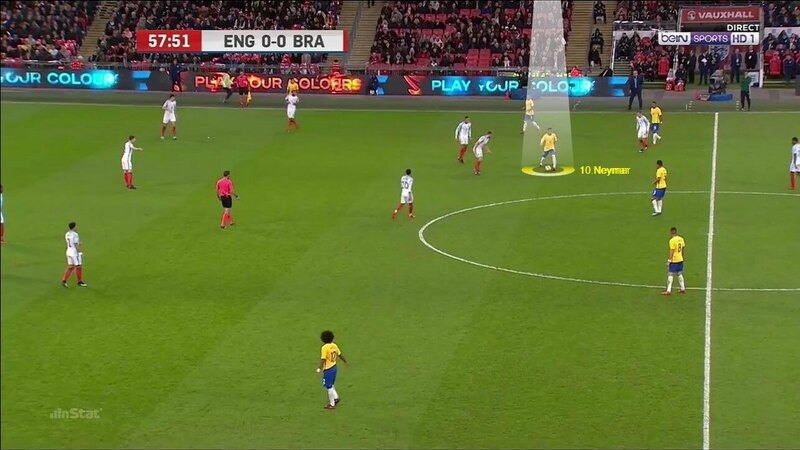 Gareth Southgate’s team kept it simple in their strategy for dealing with Neymar, who generally looked to influence the game in central areas in the final third. The sheer numbers England worked to get around him made it difficult for him to have an impact. 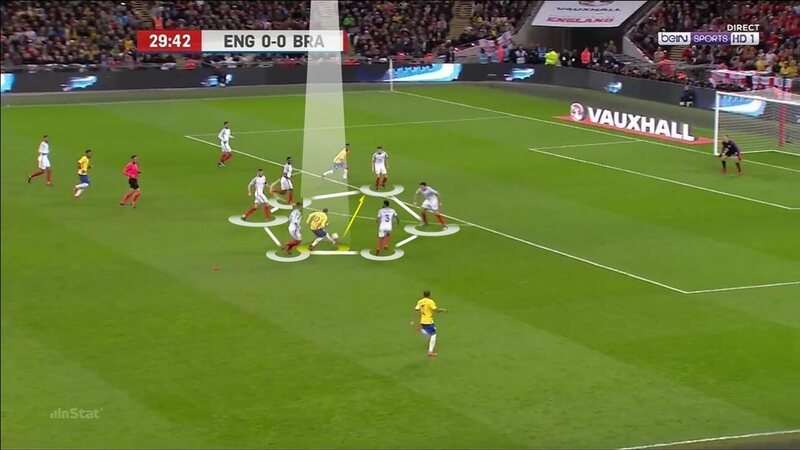 With the Brazil front three employing a high press, England prioritised direct passes into their most advanced players, often pushing their wing-backs forward and looking to their forwards – in this case Jamie Vardy – to play off them. The likes of Marcus Rashford or Jesse Lingard – a first-half replacement for Ruben Loftus-Cheek – dropped into midfield areas to give the player in possession an extra option in behind Brazil’s midfield line. Here, Rashford finds space to receive a pass from Harry Maguire, with Eric Dier covered. In the second half, Lingard in particular gave his midfield teammates a passing route forward and looked to create problems for a Brazilian midfield that was otherwise very comfortable. 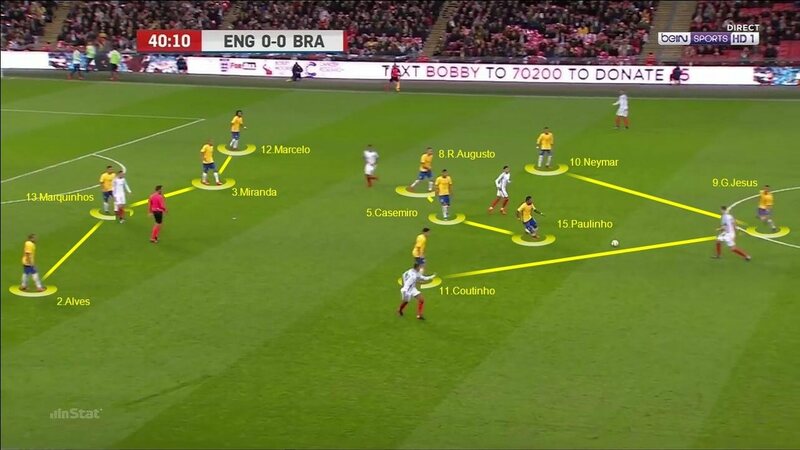 Brazil started with a 4-3-3 formation both in attack and defence. 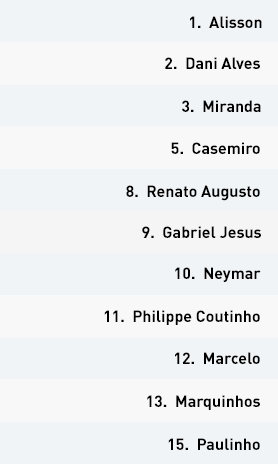 Gabriel Jesus operated as a lone striker, with Neymar and Philippe Coutinho supporting him from wide positions and Renato Augusto and Paulinho looking to break forward from midfield. 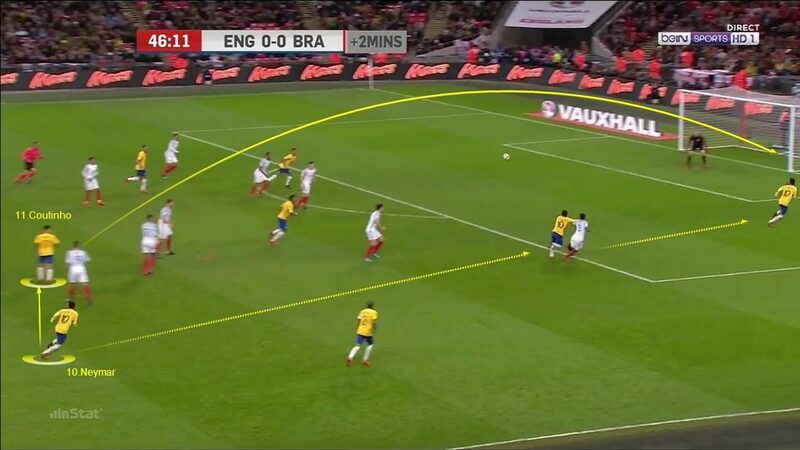 When England had possession, the Brazil forwards and midfield didn’t work overly hard to press the man on the ball. Here, it is Eric Dier who occupies the intermediate space and picks up possession from John Stones largely free of pressure. The tendency of both Neymar and Coutinho to drift inside gave Brazil very little presence in wide areas, but with England packing the central channel the visitors were often forced to play backwards while in possession. When they did find a yard of space, Brazil’s chief playmakers did offer variety in attack – as seen here, with Coutinho’s clever ball for Neymar in behind Ryan Bertrand. They rarely managed to penetrate England’s solid last line of defence, however. The longer the game went on, the further Neymar travelled in search of the ball in a bid to exert a greater influence over proceedings. 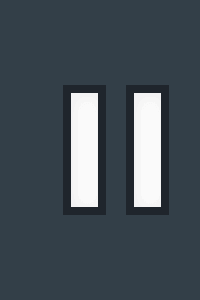 England maintained their defensive shape impressively, though. Brazil coach Tite started with a 4-3-3 formation, both in attack and defence, with Gabriel Jesus operating as a lone forward and Neymar and Philippe Coutinho supporting him from wide positions. The Seleção used combination play in all areas of the pitch, goalkeeper Alisson always looking to his centre-backs – who in turn often played into the deep-lying midfielder Casemiro. In midfield, however, the Brazilians rarely played to a high tempo. Their central midfielders struggled to find Neymar and Coutinho in space, with the two playmakers tending to drift into the central channels in which England had plenty of numbers. This meant they played with limited width throughout, instead relying on breaks from their other midfielders – mostly Paulinho – to get in behind a compact England midfield. Only then did they create the space for their two chief threats to exploit. 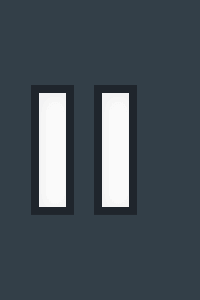 Even then, and despite their best efforts, neither Neymar nor Coutinho consistently managed to penetrate England’s defensive wall – and Gabriel Jesus found life even more difficult in advanced positions, where the home side had even greater numbers and where finding teammates in space was almost impossible. Brazil still enjoyed plenty of possession in these areas, but didn’t threaten as much as they might have expected. In the defensive transition, the visitors had few problems. Committing greater numbers forward meant they had to retreat quickly when losing possession, but England rarely counter-attacked in numbers and Casemiro in particular proved effective at covering any gaps that may have appeared in Brazil’s defensive shape. 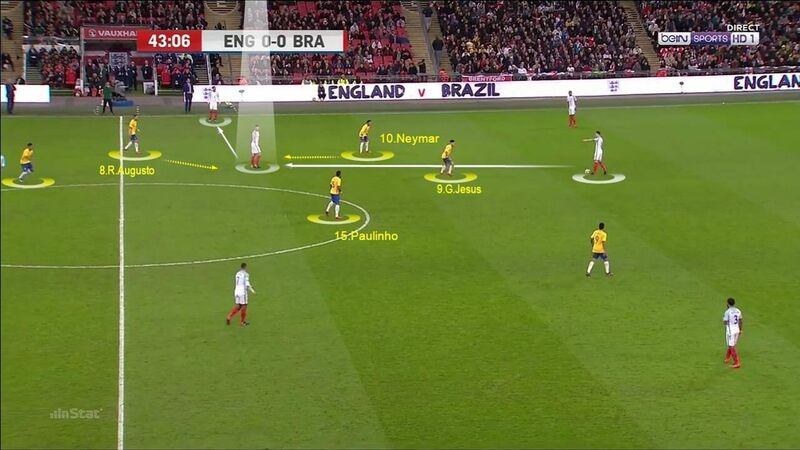 If England tried to play out from the back, Brazil pressed high with their front line of Coutinho, Gabriel Jesus and Neymar, in an attempt to force Joe Hart in goal to play long and trust that their centre-backs would have the beating of Vardy and Rashford in the air. They were solid in midfield, although their central three didn’t press their opponents too hard in possession – instead, they worked to close down the active areas around the man in possession and prevent England from playing through them towards their defensive line. 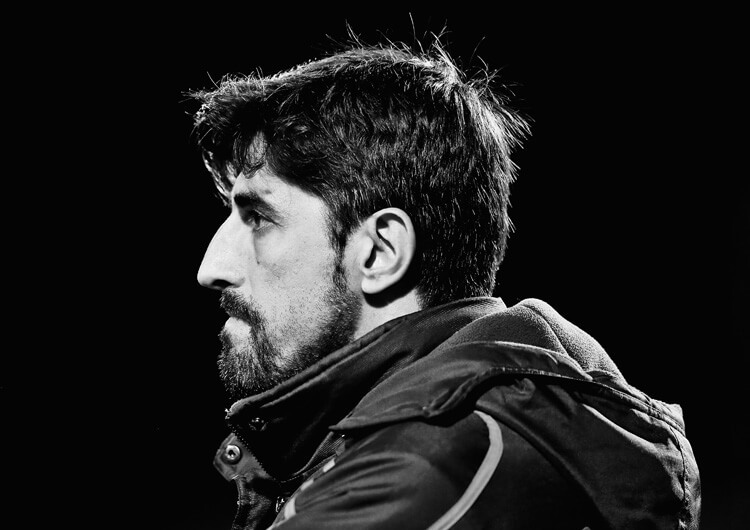 Even when this failed and the hosts found space in between the lines, the Brazil back line won every subsequent battle and never looked in any real danger. On the counter-attack, Brazil employed a combined approach. Going direct, they would look to connect immediately with Coutinho or Neymar and try to exploit any gaps in the England defence. Alternatively, if England regrouped quickly, they would look to keep possession of the ball and play patiently while looking for any potential switches into dangerous areas. This was a game in which defences dominated. Not one of the forwards on either side was able to offer any great threat in the opposition penalty area. 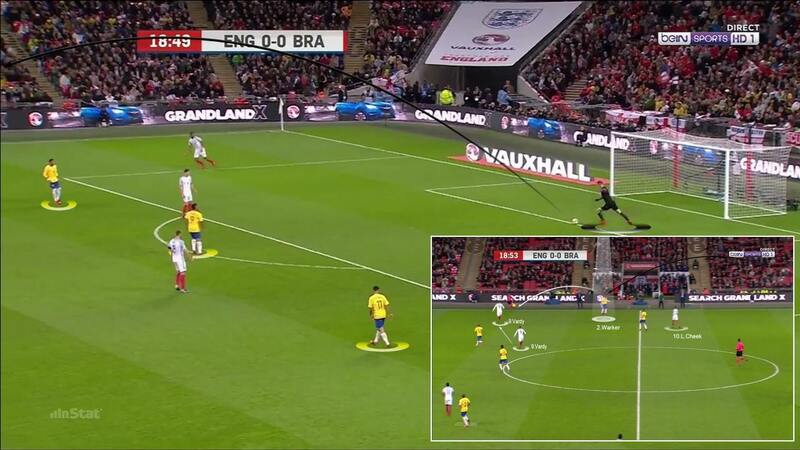 England’s mostly direct approach was easily handled by Miranda and Marquinhos at the heart of the Brazil defence. Almost all of Brazil’s forward play went through Neymar and Philippe Coutinho, both of whom worked hard and were constantly on the move in a bid to unsettle the England defence. The home back three were excellent, however, with Joe Gomez impressing in one-on-ones with Neymar. When England did keep possession, Eric Dier and Jesse Lingard impressed in their use of intermediate space, taking up intelligent positions to keep moves going. 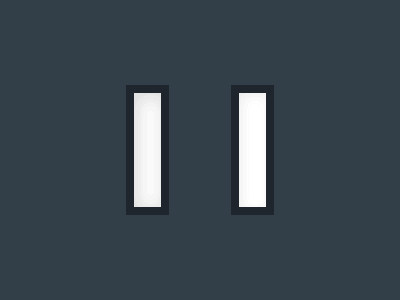 They gave Casemiro a tougher defensive job at the base of Brazil’s midfield.